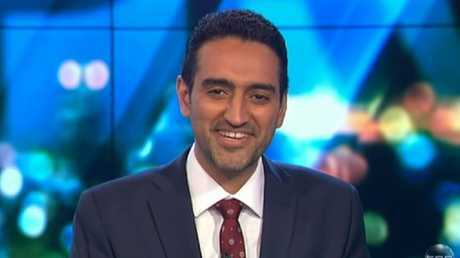 HE is one of the UK's fiercest advocates for Brexit and doesn't shy away from debate, but former UKIP leader Nigel Farage has been left stumped after going head to head with Waleed Aly. On Monday night's episode of The Project, Aly questioned Mr Farage's decision to keep his Member of European Parliament (MEP) pension despite being openly critical about the institution. "Well over half of my pension will come from the UK parliament, but yes I will be due some money - nothing like what you have said - but due some money from Brussels," Mr Farage said. "Frankly given the Stalinist way they have behaved I'll be lucky to get it." "Sorry what do you mean?" 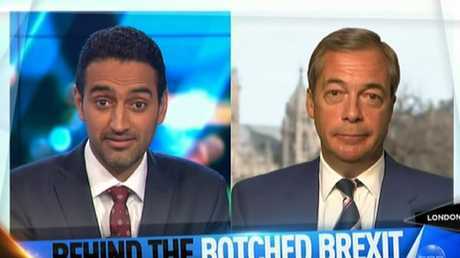 Aly asked, appearing genuinely surprised by Mr Farage's response. But Mr Farage doubled down, accusing the EU of "arbitrarily" taking money from people and operating on a "you're guilty prove yourself innocent" basis. "What is being built up in Brussels is a very authoritarian, unpleasant structure and in many ways it's a new form of communism," he said. Not missing a beat, Aly said: "If it's so authoritarian, wouldn't it be more honourable for you to say I won't take the money at all?" "Well I could but what would you suggest I do for the last 20 years - have my family live in a shed?" A flustered Mr Farage shot back. "Are you struggling? I always thought you were quite a successful businessman? I didn't think your circumstances were so dire," Aly replied, his dry response stumping the former politician. "Well," Mr Farage said, pausing before he changed the subject. "Let me tell you, 20 years in politics raising a big family does not make you wealthy, but anyway that's not the point - I chose this life, I was in business, I was doing very well, I chose politics because I wanted to completely turn around the direction our country was going in." One of the key proponents of the successful 2016 Leave EU campaign, Mr Farage has been criticised for declaring he will keep his MEP pension. According to the Guardian, Mr Farage, 54, will be eligible for the roughly $AU130,000 a year pension once he turns 63. Despite heading up the Eurosceptic UKIP until his retirement in 2016, Mr Farage was also a longtime member of the European Parliament. He famously slammed his fellow MEPs for having "never done a proper job in your lives or worked in business," in a speech after the Brexit vote.